Columbia-TriStar, widescreen 1.85:1/16x9, standard 1.33:1, languages: English DD 3.0 [CC] & Dolby Surround, Spanish Digital Stereo, subtitles: English, Spanish, French, Portuguese, Chinese, Korean, Thai , double side-single layer, 28 chapters, original theatrical poster, production notes, theatrical trailer, rated NR, 104 min., $24.95, street date 2/8/2000. Directed by Anthony Mann. Starring James Stewart, Arthur Kennedy, Donald Crisp, Cathy O'Donnell, Alex Nicol, Aline MacMahon. An intensely satisfying drama of rugged primitive justice, The Man From Laramie marked the final, and finest, collaboration of one of the most important teams in Western films: director Anthony Mann and star Jimmy Stewart. Together this perfectly-matched pair provided audiences with eight classic pictures, including Winchester '73 and Stategic Air Command. Under Mann's superb direction, Stewart departs from his well-loved 'ordinary hero" role and gives a riveting performance as a resolute vigilante obsessed with finding the man responsible for his brother's death. Among the suspects are an arrogant cattle baron (Donald Crisp), his sadistic son (Alex Nicol) and his ranch foreman (Arthur Kennedy, in the best performance of his career). One explosive confrontation, in which Stewart is dragged by a wild horse and shot in the hand at close range, is one of movie history's most memorable sequences. Among the first Western's filmed in CinemaScope, The Man From Laramie uses the wide-screen technology to emphasize the scope and power of this harrowing action-drama, making it a perfect example of the Western as America's epic art form. If you're reading this, you're probably a bigger fan of westerns than I am. I don't dislike the form, but it never did much for me. As such, I'd never heard of The Man From Laramie prior to its availability on DVD; when I hear the word "Laramie," I think of the brand of cigarettes prominent on The Simpsons, not a James Stewart movie. Despite this lack of knowledge, I found TMFL to be a fairly entertaining and well-produced picture. Partly this is because I like Stewart and find him to be a consistently compelling presence. While not in a league with his magnificent work in Mr. Smith Goes to Washington, Stewart offers a strong performance here as a vengeful man trying to find his brother's killer. His quest lands him in a town in New Mexico where he quickly the center of all the men's negative attention (but the women-folk seem to dig him!). TMFL actually proceeds more like a mystery or a thriller than I'd expect from a western. Really, Stewart plays something of a detective who's trying to get to the bottom of what's happening in town. The longer he sticks around, the more he discovers and the more entangled matters become. The film progresses at a decently-quick but appropriate pace, and the action is balanced with enough character development to make the participants compelling. I can't say that I was completely enamored of The Man From Laramie, but I found it to be a fairly entertaining and provocative film. 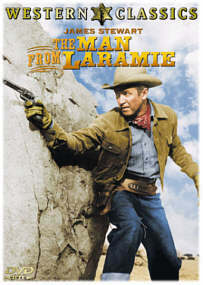 The Man From Laramie appears in both its original theatrical aspect ratio of 2.35:1 and in a fullscreen version on this double-sided, single-layered DVD; the widescreen edition has been enhanced for 16X9 televisions. Only the widescreen image was viewed for this article. I must admit that while I applaud Columbia-Tristar's (CTS) continued efforts to include both letterboxed and fullscreen versions of movies where possible, I have yet to make sense of how they decide to do this. It would seem to be a simple space decision; if both will fit, then that's it! That's why supplement-rich DVDs like Ghostbusters and Against All Odds offered only widescreen renditions. However, the question I have concerns why some CTS DVDs don't include fullscreen editions. I find it odd that The Man From Laramie gets both versions - even though it's a CinemaScope film, one that would suffer horribly from panning and scanning, and also a movie that likely will appeal mainly to serious fans, the vast majority of whom would have no interest in the altered image - but something as "lowest common denominator" as Bats offers only a widescreen picture; fans of the latter are much more likely to prefer fullscreen to those who like Laramie. Although I intensely dislike DVDs that aren't presented in their original theatrical aspect ratios, I'm no widescreen snob; if others want fullscreen, more power to them, no matter how badly that cropping destroys the composition. As such, I support DVDs that include both versions, as long as it doesn't mean the studio omitted supplements to do so. I just find myself very confused about CTS's policy and don't understand their lack of consistency in this regard. End of rant - back to the Man From Laramie DVD. I had a very hard time rating the picture quality of this film simply because it was so erratic. At times it looked terrific, while other scenes seemed fuzzy and problematic. Ultimately it appeared to average out to a "C+", but that's not a constant status; the picture goes up and down all throughout the movie. Sharpness generally looked pretty good, but it also seemed rather hazy and soft a lot of the time; there was no rhyme or reason to this - focus could shift within the same scene, and sometimes during the same shot! Moiré effects were surprisingly absent, given the complexity of the western landscape (all that dirt and dust often causes a lot of shimmering), but I did see some problems with the anamorphic downconversion on my 4X3 TV; a small amount of "ropiness" entered the image during a number of scenes. The print itself looked pretty good for such an old film, but a number of flaws nonetheless often marred the image. Grain appears fairly regularly, and I also detected a variety of white streaks, black speckles and other dirty-looking flaws. Colors appeared decent though occasionally seemed washed out and somewhat pale. Browns and other earth tones fare best here; at times they appear wonderfully saturated and natural. However, it remains a hit or miss proposition and consistency lacks. Finally, black levels appeared adequate though sometimes were too dark, which occasionally rendered shadow detail too heavy and opaque. Ultimately, I found The Man >From Laramie to offer a generally satisfying picture, but its quality variations were slightly maddening at times. Anyway, this nascent attempt at directional audio works okay but not terrifically. The music swells nicely from all three speakers and fills out the image well. Effects tend to stay toward the center, but they also creep into the sides regularly and we even hear some passable panning. Speech is the main directional problem, however. For some reason, it tends toward the right channel. Sometimes this seems appropriate, as a character on the right side of the screen will have his/her voice emanate from a point about midway between the right and center speakers. However, the same does not happen for actors on the left half of the TV; they stay anchored in the center. Sometimes actors in the center also have their speech come from the right. It's inconsistent and annoying, to be frank; I'd prefer they just kept the dialogue in the middle instead of mucking around with it like this. Still, it's nice to see the sound designers try to expand the form - can't make an omelet without breaking a few eggs! In general, the quality of the audio seems good. Dialogue seems intelligible and clear, although the excursions it takes toward the right sometimes appear a bit muddy. Effects usually are fairly clear, though some distortion creeps in at times, usually during gunshots. The music appears somewhat muffled and flat, but it displays adequate range and even boasts some nice bass at times. While the audio sounds dated and obviously cannot compare with more modern efforts, it's still very listenable and quite strong for a film of its era. Some people believe that the trend for trailers to reveal far too much of a film's plot is a new development. As shown through the preview for The Man From Laramie that appears here, that ain't the case; this sucker actually shows much of the movie's climax! As such, don't watch it unless you've already seen the film. The DVD also features a one-sheet poster that's displayed poorly. CTS try for cleverness when they present stillframe materials, almost always to the detriment of viewability. Here they show the poster as though it's been pinned to a wall; cute, but this reduces the size of the image to only about 60% of its potential and makes it much harder to see than it should be. Someone needs to tell these folks that simpler sometimes is best. Finally, the DVD includes brief but informative production notes inside its booklet. The Man From Laramie is a pretty good western that makes a pretty good DVD; although wildly inconsistent, the picture generally seems nice, and the three-channel sound is very good for its era. The DVD skimps on extras, unfortunately, but for fans of the genre, this disc will make a nice addition to their collections. If you're less certain about your interest in this kind of film, you may want to try it as a rental. A Silver Screen Legend: Jimmy Stewart--"This is my tribute not only to a silver screen legend but to an American hero who left us a wonderful legacy through his wonderful life and films."